Summer unofficially kicks off this weekend - and the summer festival season is now underway. So, that means it's time to look at your calendar from now through Labor Day (and beyond) and map out the delicious celebrations. Each season, BrewFest Partners hosts a number of fun and well-organized events for beer lovers in the Midwest. I've been to several of them and never tire of attending a new one or heading back to a favorite venue to get some tastes of the best craft brew out there. Click here for the full schedule of the 2017 events by BrewFest Partners. Coming up this month is the Barrel-Aged Brews Cruise, one of several brew cruises this season aboard the Mystic Blue out of Navy Pier. 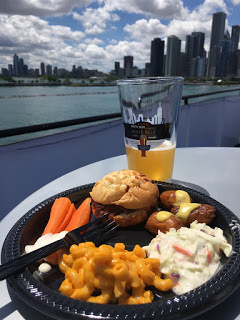 I attended one of the beer cruises last year and really I can't think of a better way to spend a weekend afternoon than sipping craft brews on Lake Michigan. It makes for such a relaxing time and you cannot beat the views. This one happens to be on Father's Day, so if you are looking for a gift for your father, hubby or another guy in your life...you're welcome. It's a gift they will definitely enjoy. Among the other beer festivals this summer and early fall are Great Lakes Brew Fest in Racine, Wisconsin, South Loop Beer & Cider Fest, Border War Beefest in Kenosha, Munster Ale Fest, Wisconsin and the Milwaukee Firkin Fest. For more information, visit brewfestpartners.com.